Zucchini is a vegetable that belongs to Cucurbitaceae family like ridge gourd, bottle gourd and cucumber. As it is not grown in India and is mainly imported, we avoid buying it. We always try to eat locally grown veggies and fruits as far as possible. First time I ate Zucchini at some restaurant in NYC. It was an Indian restaurant and we ordered vegetable Biryani. To my surprise, it was full of Zucchini pieces. Though I didn’t like Biryani, I liked the taste of Zucchini. Around two years back, I happen to see this vegetable once in the local farmers market in Hyderabad. It was grown in the hilly region of Kodaikanal. On that day, filled my bag with 5 kgs of it 🙂 From that time, I occasionally get these from the farmers market. I try different recipes with this veggie like frittata, pizza, Ratatouille. Among all these, frittata is our favorite, its nothing but a baked omelet. I tried growing it on my terrace garden but no luck for two years 🙁 Every time it fails with some or other issue. Maybe it doesn’t suit for Hyderabad weather. This recipe is a stir fry with potatoes and Indian spices which will be good as a side with dal or sambar. You can even eat it as a salad if you want something light. 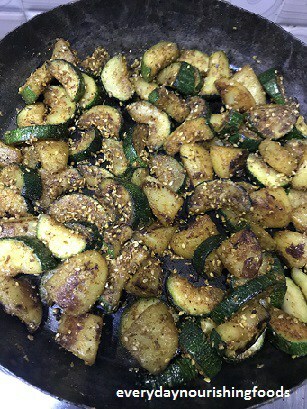 Zucchini and Potato stir fry with Indian spices. Can be eaten as it is or as a side with roti or rice. Heat a pan, add oil or ghee. Once it is heated add potato pieces and a little salt. Let them cook till half done. Meanwhile roast sesame seeds and cumin seeds in a pan separately. 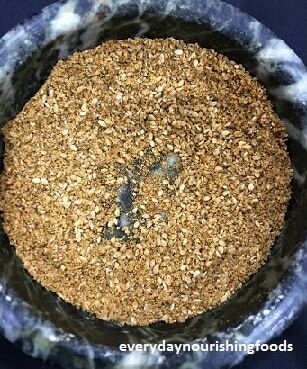 Make a coarse powder of these seeds. Add other spices to this powder and mix everything well. Keep this aside. Cut Zucchini into 1/4th-inch cubes or half-circle slices. 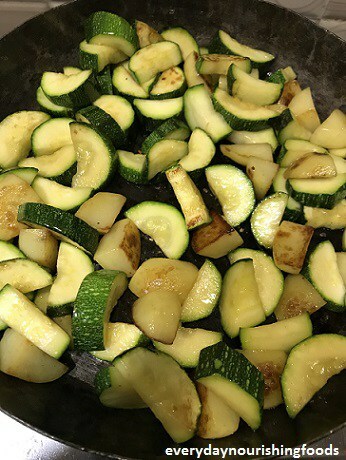 Once potato is half cooked, add these Zucchini pieces and cook them till they are done. For the mentioned quantities, it will take around 15 minutes on medium flame. Cooking time varies on size of vegetables, the pan used and stove flame. Once they are cooked completely, add the spice powder and adjust salt. Meanwhile roast sesame seeds and cumin seeds in a pan separately. Make a course powder of these seeds. Add other spices to this powder and mix everything well. Keep this aside. Pretty nice post. I just stumbled upon your blog and wanted to say that I’ve truly enjoyed browsing your weblog posts. After all I will be subscribing on your rss feed and I’m hoping you write once more very soon!